Greetings and happy Sunday! Usually on Sundays I do a segment called 'Sunday Vintage' where I showcase one of my pieces of clothing from my vintage collection. I lightly sprained/re-activated an old injury in my ankle/foot last weekend, and of course it was during a week when I had no photos for new outfit post (aside from Special Pieces Saturday). I decided my ankle brace probably didn't need to make it's fashion debut on my blog just yet, so I didn't have anything planned for this Sunday. But yesterday I was back in action, even wearing heels(!) and I took an outfit photo for an intended #ootd for Instagram. I kept taking photos because I wasn't feeling any through my view finder, but when I uploaded the pics to the computer I really just loved the photos way more than expected so I decided to make a whole outfit post of them. Why did I like them so much? Mostly because the clouds were insane! A storm was rolling in and changing the lighting-literally-every 30 seconds. It felt challenging in the moment but I think this was actually a very happy accident. Enjoy! I really love band tee shirts with more "demure" skirts. I love how it's edgy and unexpected, and frankly kind of weird...like my personality. In case you can't see, the shirt is a Tegan and Sara shirt. I saw them five years ago at The Ogden Theater in Denver. They were amazing, so if you get the chance to see them you should! This is also one of my favorite concert tees ever! VERY minimal editing went into these. In fact, I rarely use any form of photoshop or editing software in my photos because I try to maintain a relatable 'girl in real life wearing her favorite outfits' look. Sometimes an exposure needs some heightening or some warmth added to save an otherwise great photo, but past that I call it good. I literally tweaked only a handful of these by the slightest of notches just to better outline the colors that were happening in real life. Thank you! 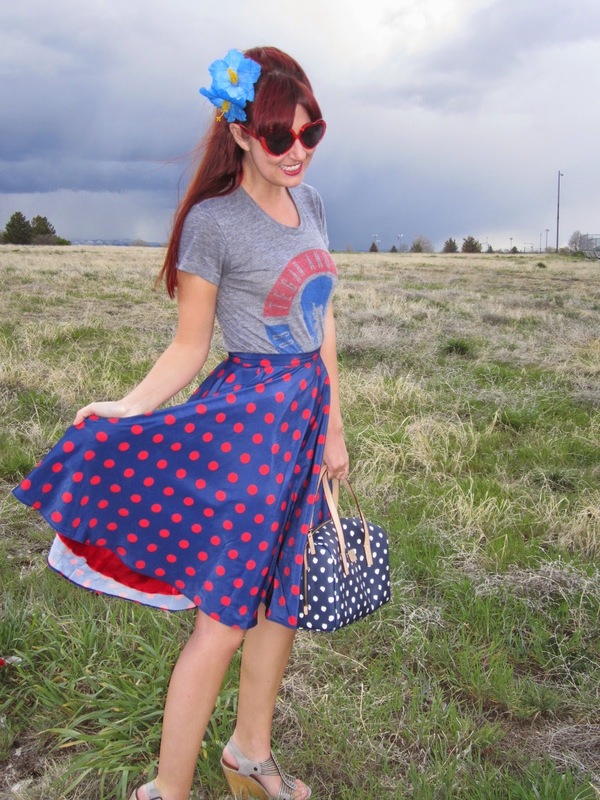 It's a great staple skirt! Really pretty, love the different colours! 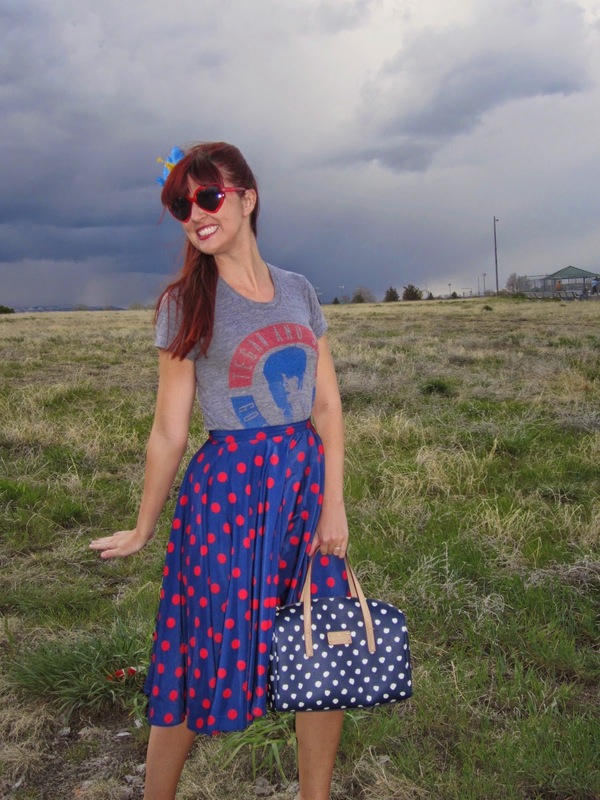 I love the graphic tee and polka dots! These photos are so cool! I can't say I've had any happy accidents like this while taking pictures...but if there are any storm clouds coming my way, I just may have to try some photos after seeing these! Love your smile! <3 And the glasses! :D You're so stylish. Adorable look, Lauren. 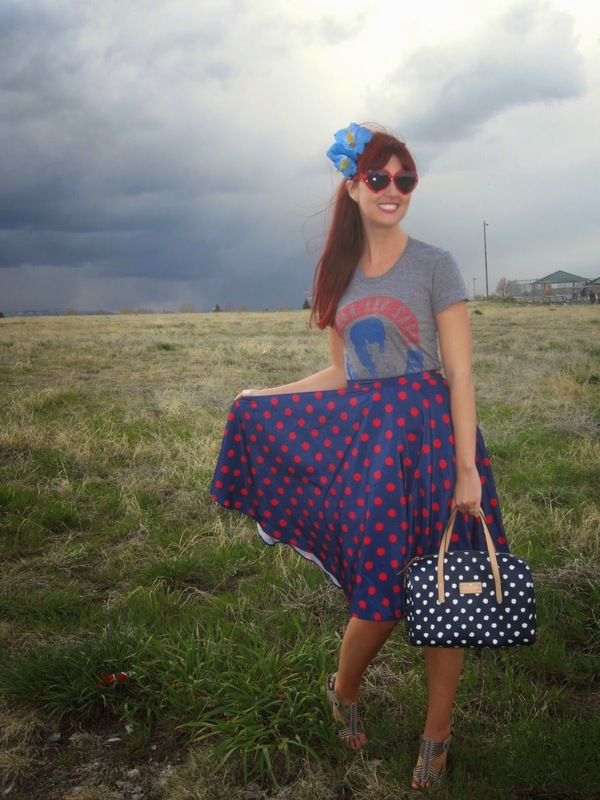 I totally love your polka skirt as it has that retro vibe :) Nice way to dress up a tee, too! I just recently updated my blog. I'd love if you can come over and share your thoughts. 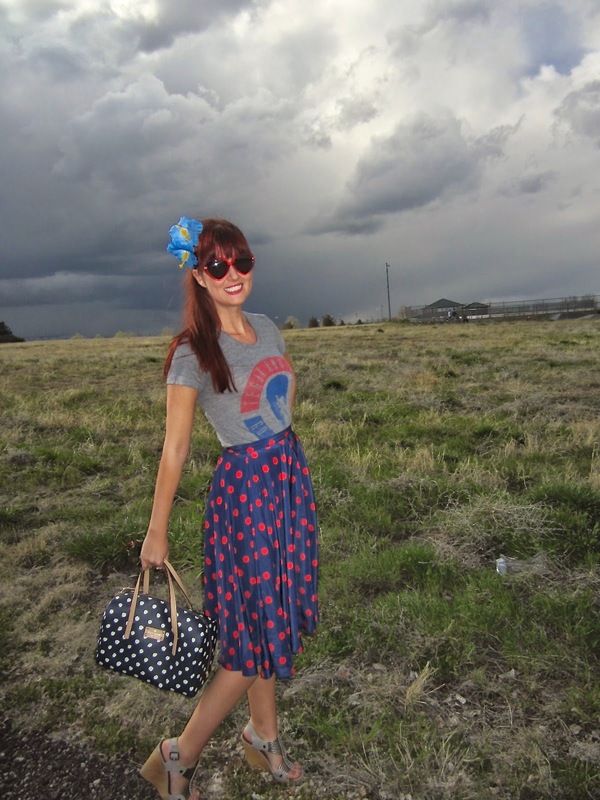 I love the unexpected pairing of a concert t-shirt with circle skirt - you've inspired me! You have such a unique style. It's ace!! Thats so much for your kind comment on my blog.. I'm very glad you liked the post! Omg. Radness! This is how you style a tee! I really love this. 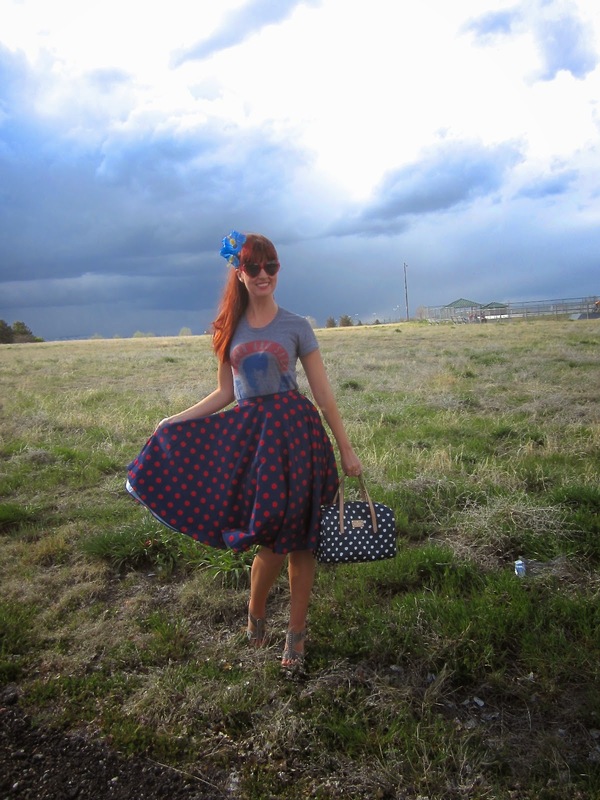 Awesome skirt! 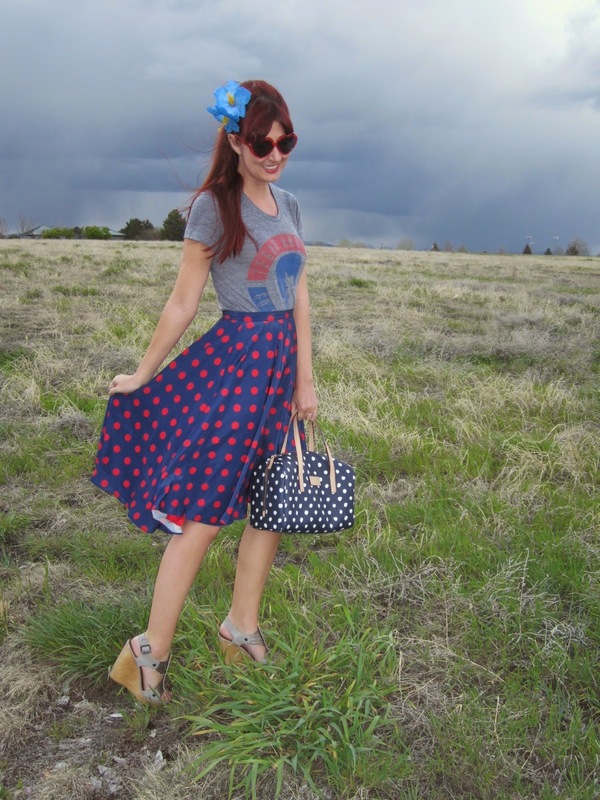 I really love how you paired this tee shirt with this adorable skirt. I love anything polka dots. 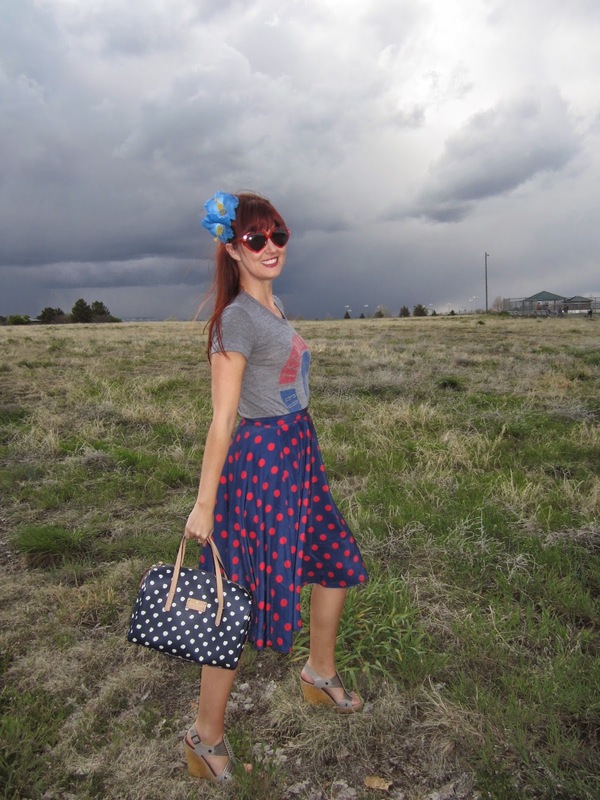 That is also a really cute polka dot purse to match. You are a style master. 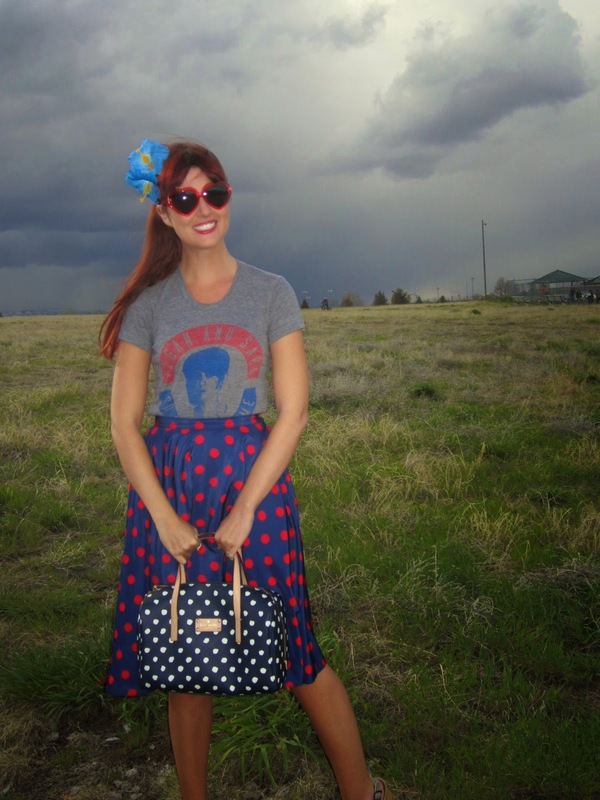 So glad I found your blog because I love your looks and also a huge huge fan of anything vintage.